Inspired by Pinterest and excited to use my lovely KitchenAid stand mixer, I made homemade marshmallows this year for Christmas. They turned out amazing. Sweet soft pillowy goodness covered in powdered sugar and flavored with vanilla. I had thoughts of putting these into hot chocolate or toasting them over an open fire to make s’mores, but none made it that far. I just ate them. It’s a good thing that I packaged up the ones I did – a few people got them in the mail for gifts. I put a few in a plastic baggie to see how long they would last, and they got pretty stale after about a week so I recommend enjoying them within the first few days. That will not be a problem, I am sure! Stale ones are kind of like Lucky Charms (the marshmallows, not the cereal). You can also cut them into fun shapes using cookie cutters, if you are able to spread it thinly enough and make the top mostly smooth. I did not do this. Not going to kid you here, this is not an easy recipe, despite the short ingredient list, but it is totally worth it. This is adopted from The Kitchen Is My Playground (another awesome food blogger). I like vanilla but not *that* much so I cut it back a bit. I have the hardest time remembering not to spell it “marshmellows” because that’s how it sounds. Am I the only one there? In the bowl of a stand mixer, combine gelatin and 1/2 cup cold water. Allow to sit while you prepare the sugar syrup. In a medium saucepan, combine granulated sugar, corn syrup, salt, and remaining 1/2 cup cold water. Cook over medium heat until sugar dissolves, stirring frequently. Raise heat to high and cook until the sugar syrup reaches 240 degrees on a candy thermometer. Remove sugar syrup from the heat. With the mixer on low speed and fitted with the whisk attachment, slowly pour sugar syrup into the gelatin. Turn mixer up to high speed and whip until very thick, about 15 minutes. Add vanilla and mix thoroughly. Line the bottom and sides of a 9x13" glass baking dish with plastic wrap. Spray plastic wrap with non-stick cooking spray and dust generously with powdered sugar. Pour marshmallow mixture into prepared pan, smooth the top, and dust top with more powdered sugar. 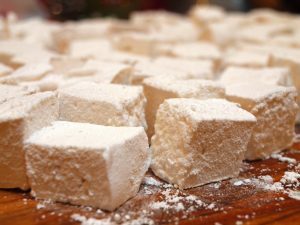 Allow marshmallows to stand uncovered overnight to dry. 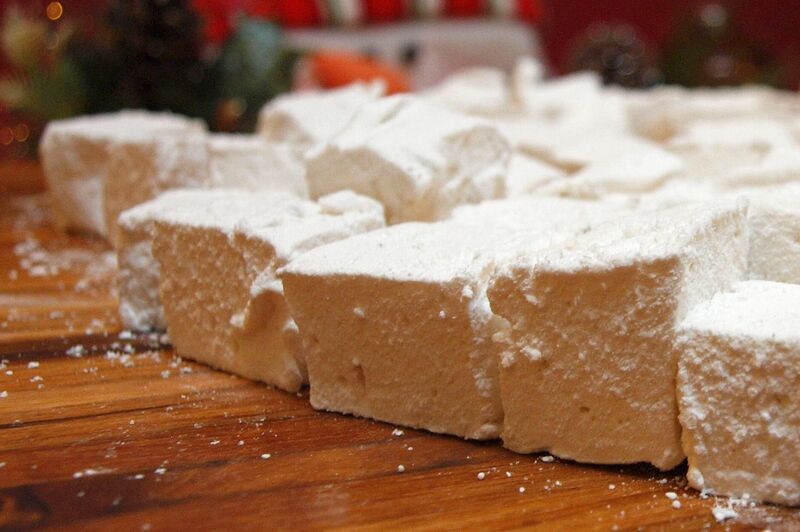 Turn marshmallows out onto a cutting board. Using a sharp knife, cut marshmallow into 1-inch wide strips. Cut strips into 1-inch squares. Roll cut sides in powdered sugar. Store in an airtight container at room temperature for up to 3 or 4 days (after this they get stale). If marshmallows become sticky, remove the container lid for a bit to allow marshmallows to dry. This entry was posted in Desserts and tagged dessert.